Each year, when completing client income tax returns, we note the following (usually) large dollar value items that create large tax deductions – most require one or more cash payments during the year. Correct paperwork is essential to ensure that our expenses can be claimed as a tax deduction. 1. Income protection premiums – these are premiums that you pay personally, and your insurer will provide a letter at the end of the year confirming the amount of your payments that qualify as an income tax deduction (please email a copy of this letter when received). 5. Study Course Fees – for work related courses with a direct connection to your income earning activities. Where course fees are paid up front, or funded via Fee-HELP, a deduction is available for the cost of the course fee in the year incurred. In many cases, the first $250 of the fees may not be deductible, but the purchase of a computer costing more than this amount, or child care fees to enable study to occur, may be able to offset the $250 non deductible portion. Other costs such as study use of home internet, stationery, travel to place of study, etc can all be included in your study claim. Just a reminder, for most residential rental property owners, travel to and from their property (for example, to undertake repairs or to inspect the property) ceased to be a deduction from 30 June 2017. The unclaimed travel deductions cannot be included in the cost base of the asset on eventual sale. Where you operate a residential property business, this deduction continues to be available. The deduction is also available where you own commercial or industrial property. In a rental property context, second hand assets acquired after 7.30pm on 9 May 2017 are unable to be depreciated, unless acquired under a contract prior to that date. This also applies to assets purchased before 1 July 2017, but not used to generate rental income in the 2017 financial year. An example of this is where your home is purchased before 1 July 2017, and later converted to a rental property – depreciation will not be able to be claimed on the assets in the home. Separate rules apply to the capital allowance concessions for these properties. Where investors purchase newly constructed assets, they will continue to qualify for both depreciation and capital allowance concessions. For those who have sold their home or other land/buildings since 1 July 2016, you may have already been impacted by this new system, but as the threshold property value until 30 June 2017 was $2m, the impact was limited. From 1 July 2017, where a property is sold with a sale price of $750,000 or more, the purchaser is required to withhold 12.5% of the sale price and remit it to the Taxation Office, unless the vendor provides a clearance certificate (obtained from the ATO), confirming they are not a foreign resident, before the due date for settlement. This withholding obligation was designed to assist foreign residents with meeting their capital gains tax obligations on disposals of Australian property, but has been applied to all property sales, regardless of the nationality of the vendor, where the sale price exceeds $750,000. Most solicitors are now well aware of these obligations, but settlement delays may still occur where a certificate has not been obtained. The main point to remember is that this relates to all property sales, not just sales by foreign residents, so we recommend that, as soon as your sale contract has become unconditional, you arrange to apply for your clearance certificate. For the 2019 financial year, the introduction of Single Touch Payroll (STP) means real time reporting of your wages and superannuation to the Taxation office, each time you receive a pay. In 2018/19, this applied to all employers with 20 or more employees, with all smaller employers using STP from 1 July 2019. When an employer reports through STP their employees will see their year-to-date tax and super information in myGov. This information will be called an Income statement and will be updated each time their employer runs their payroll. At the end of the year, payment summary information will be available on MyGov from 15 August 2019. There is a part claim for the offset where your spouse’s income is between $37,000 and $40,000. Where your income has exceeded the rebate threshold that you are currently claiming, you will be required to repay the excess rebate received when lodging your income tax return. Please note, this will be the case even where clients income is below the tax free threshold and no other tax is payable. The other alternative is to contact your private health insurer and ask them to reduce or remove the rebate from your premium payments, increasing the amount payable. 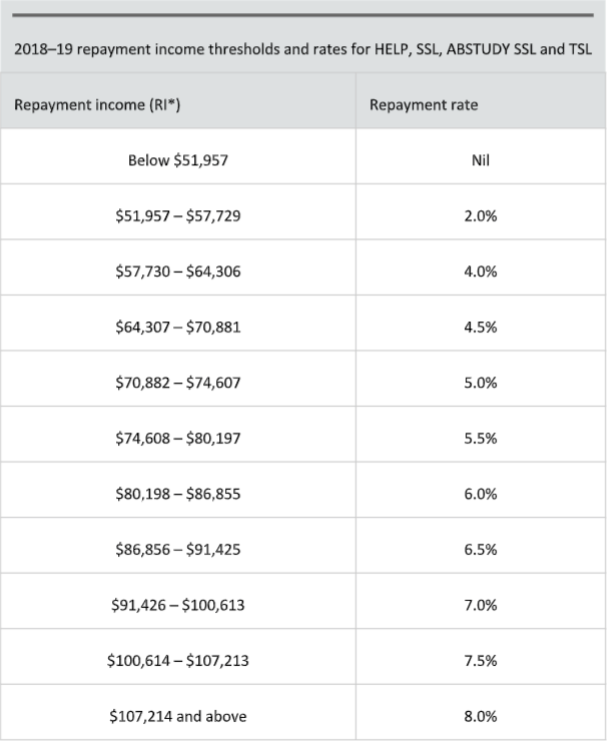 Far below please see the 2018/19 HELP repayment thresholds. For those with a HELP debt, but who are currently non residents of Australia, the link below will assist in you calculating your HELP repayment requirement, based on your overseas income.